This film focuses on three distinct story lines on both sides of the United States and Mexican border and explores the long term consequences of those who fight for the war on drugs. The primary story follows the American appointed "Drug Czar" (Michael Douglas) and his daughter (Erika Christensen), who has graduated from recreational drug use to a routine drug user. 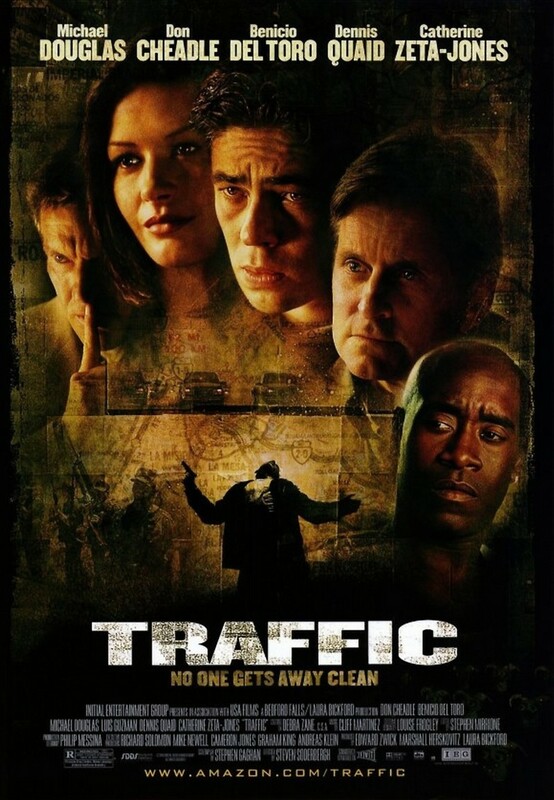 The second story trails DEA agents (Don Cheadle & Luis Guzman), who take down a big time drug trafficker (Steven Bauer), leaving his pregnant (Catherine Zeta-Jones) wife to take over his drug business. The third story takes place in Mexico and observes the life of a Mexican general (Benicio Del Toro), who has made it his life mission to destroy a major drug cartel.